First off, please allow us to take care of some quick announcements. 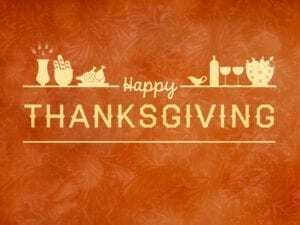 The Delaware State Courts and GDWG offices will be closed on Thursday, November 22nd and Friday, November 23rd for the Thanksgiving holiday. Justice of the Peace Courts 11 (New Castle County), 7 (Kent County) and 3 (Sussex County) will remain open. Our firm has so much to be thankful for this holiday season and much of it starts with our clients. We are fortunate to serve so many great folks across the First State and want to thank all of you for trusting your legal needs to our team! We’d also like to thank all of the amazing and dedicated real estate and mortgage pros with whom we collaborate nearly every single day in our offices. Working with all of you to get great people into new homes and properties is one of the great joys in which we all share. Last and never least, we want to recognize our own fabulous staff here at the firm. From those who have been with us for decades to the new faces who have joined us just this past year — thank you all. Again, we wish everyone a very Happy Thanksgiving and cannot wait to hear from you throughout this holiday season! In a Divorce, Distribution does not Always Mean Half Happy New Year from GDWG!